Description: Lincoln could hardly carry a tune, though he tried a lot. He often enjoyed playing the Jew's harp or harmonica to fill his need for music. 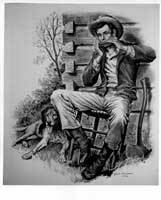 This art depicts Lincoln in chair, leaning back against a log building, with an ax and dog beside him. Abe has a harmonica to his lips.